Staying organized is no easy task. One new option: Qu-s (pronounced like cues, for how software gives you your cues for the day) helps bring order in the midst of chaos. 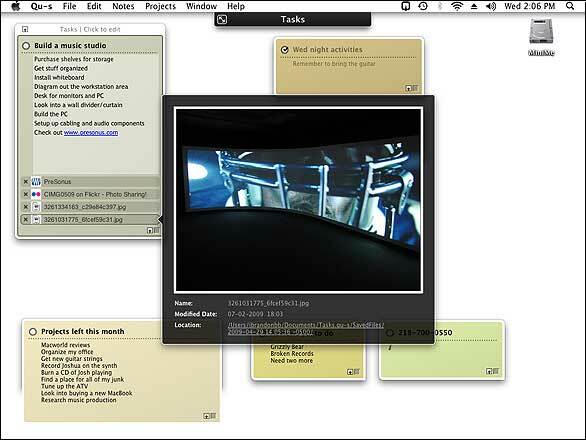 It’s a sticky note utility—similar to Circus Ponies NoteBook ( )—that runs on the desktop, so it’s always viewable. You can add a phone number, jot down a grocery list, or assemble a list of your favorite Web sites. Yet it’s more than that—hidden beneath the sticky notes is a useful project manager. Qu-s is refreshing to use compared with other desktop organizers. Notes “stick” to the desktop, in varying degrees of opacity, even when you switch to another application. This means you can organize notes in a corner of the screen and even group them together for easy viewing. With Dashboard notes, you still have to switch to the Dashboard. Unlike the MyDay app included with Entourage 2008 ( ), Qu-s is actually easy to use and make part of your daily routine. As I used the app over several days, it became a trusted ally—especially in that hectic moment when I needed the phone number for a new business partner right now. It’s a “look at the screen and use it” app. You can turn any text into a bulleted or numbered list by using a menu option. Or, you can turn list items into check boxes that you can click when each item is done. Each note has a check box as well, for when the entire list is done. Each note also rolls up into an overall project. In practice, this means you see only the notes that correspond to a particular project, such as home chores or a work assignment. Switching between projects is easy using a menu—or you can Option-click on a note. Qu-s has some subtle but useful features. You can change the color of notes using the color wheel—you’re not restricted to a limited color palette. When you do change colors, each new note uses a slightly different hue from that color spectrum (say, a lighter shade of brown). Qu-s is a freeform project manager at heart. After you add a bunch of notes, you can then view all notes related to a project and print them, export all notes as text, and manage projects. You can also file notes away for storage, reorder them, and delete them. Over a long period of time, Qu-s reveals itself as a handy tool for managing your thoughts and tasks. That said, the program has some drawbacks. While the project manager is cool, it’s no match for a program like Daylite ( ) that lets you associate tasks with people in a group. Even Web 2.0 sites like Basecamp offer more project management features. Also, in the current version, you can’t print a single note directly—you have to first use the project manager to organize the notes. However, the vendor says that active note printing may be added to future versions. You also can’t just grab a note and resize it—you're forced to use a more limited “note width” option. (You can resize vertically, not horizontally, by clicking and dragging.) You can change fonts in a note, but it’s a bit confusing because there is no apply and cancel option. So, once you select a new font for a note, you’re stuck with it unless you pick another. Probably my biggest complaint: once a note is “embedded” in the Finder (which happens after a ten-second delay), there’s no way to just click on a note. You have to Command-Tab (or Alt-Tab on some third-party keyboards) over to Qu-s (or find it in the dock) to access the notes again. I like being able to see notes at all times, but I’d like to be able to access them quickly via a click. According to the developer, this behavior is intentional—Qu-s works that way so that you can move items such as windows and icons around in the Finder without using Qu-s by mistake. That’s a good explanation, but it results in one extra step to access the program, which is not very Mac-like. Q-us is a handy tool for keeping you organized, even if it doesn’t have the full project management power of Daylite or the flexibility of Circus Ponies NoteBook. We found some anomalies when working with URLs, too. While dragging links into Qu-s creates a Web archive that opens up a small Web window, a bug in the version we tested only recorded text from the address window onto a note. However, if you drag the Favicon from the address window, it will record as a Web archive. Qu-s is not the most stable app we’ve ever tested. It crashed during our review process, and does not work that well with Safari 4. The vendor says that he’s working on browser compatibility improvements for future versions. Qu-s 1.2 has some hefty competition in the Mac market, starting with OmniFocus ( ), Things ( ), Circus Ponies NoteBook and the myriad of sticky note options for the Mac Dashboard. Yet, at just $17, it’s a good buy because it keeps you organized without a lot of mouse-clicking. We think the concept for Qu-s is sound (though the name of the app could have been a bit more intuitive) and look forward to a resolution of some of the stability and browser compatibility issues and bugs that often plague early software releases. The Alt-Tab reference was revised to take into account that the author uses a third-party keyboard. Command-Tab aligns the keystrokes with a standard Mac keyboard.